Forbes credits some Super Bowl advertising campaigns with redefining brands. Audi's Super Bowl ads were the catalyst for almost doubling Audi’s market share. Chrysler experienced an increase in sales of 54% from 2011-2014 from the introduction of a memorable Super Bowl commercials. Although Audi and Chrysler generated positive returns from their commercials, there are significant risks that are taken when producing a Super Bowl advertisement. Marketers flirt with the probability that their investment could ultimately flop, receive negative feedback, or just experience a neutral impact on sales. However, there is an economic alternative and equally effective way to gain strong attention by the massive Super Bowl audience with aerial advertising with Van Wagner Aerial Media. Aerial advertising is the most cost effective medium available on the market. It surpasses television commercials, in-venue signage, and sponsorships - all of which cost millions. Flying aerial advertisements during the Super Bowl is ideal because companies are able to fly campaigns days before the big event. This ensures the advertisement will be seen by the exclusive Super Bowl crowd and is associated with the premiere events leading up to the grand finale. Nearly 80% of the crowd is comprised of executives who contribute to the $400 million that is spent during the celebrations before Super Bowl Sunday. On Super Bowl Sunday, your aerial advertisements will be soaring over Levi Stadium gaining recognition by all the fans that immediately associate your campaign with the prestige of the Super Bowl and the NFL brand. This type of recognition conveys the idea that your brand is superior to its competitors. Flying in the air promotes prime, clutter-free real estate and produces a 70% rate of recall – the highest of any advertising medium today. Aerial advertising bypasses the exclusive sponsorships on the ground and flies high promoting your brand with great clarity. It guarantees instant recognition orchestrated to perfection. Van Wagner Aerial Media operates with cutting edge aerial technology and produces a fully customized experience from flight route to banner creation. 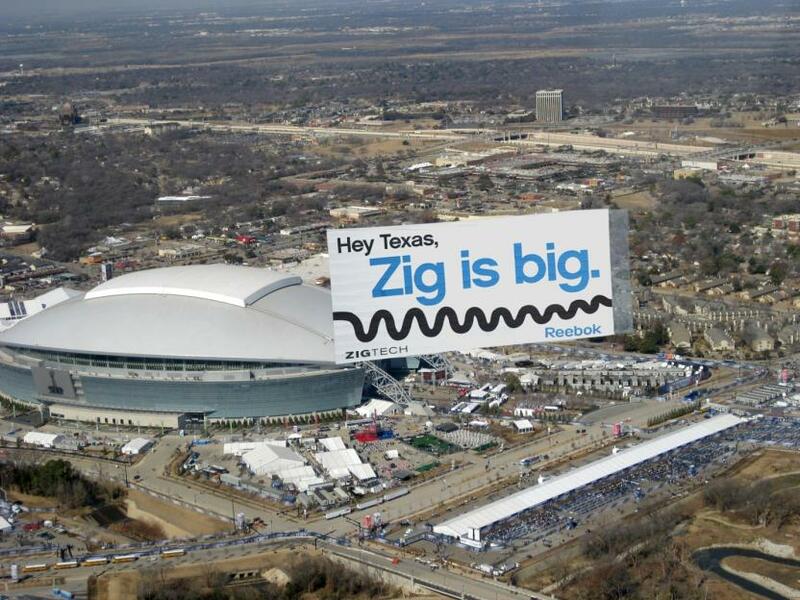 We guarantee the most impressive and impactful aerial billboard in the sky. 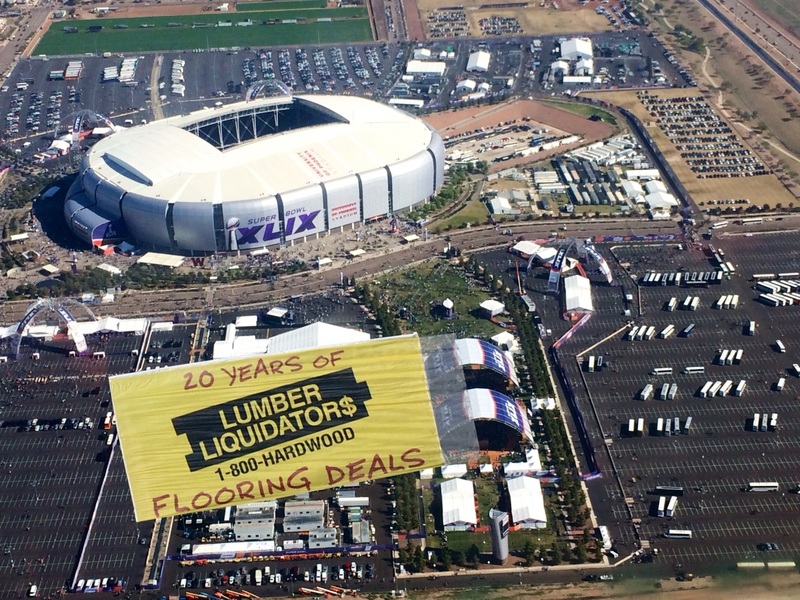 Last year, President and CEO of the Arizona Super Bowl Host Committee, Jay Parry quoted, “We exceeded our expectations with 1,015,000 visitors from around the world.” Flying an aerial advertising campaign to an audience this enormous is a no-brainer. Your brand can dominate the sky and connect with the exclusive Super Bowl audience. It is cost-effective compared to the hefty price tags of Super Bowl Sunday commercial advertisements. We are capable of producing various banner sizes and even perform formation flights that include 2-5 aerial billboards trailing after one another to create a notable experience. This approach to advertising is unique and unparalleled to the typical signage seen on the ground during the Super Bowl events. Impact the crowd from a different, equally effective, and economically sound way by flying with Van Wagner Aerial Media. Click the button below for a free quote today!